Driving home through the bottom of Colorado you cant help hitting mountains. A jigsaw puzzle of passes lies ahead. In the winter, choose your poison, Lizard Head, Wolf Creek, or, in the middle, the dangerous one. The route we took last week put us through the middle route, a chain of two passes leading to a ribbon of asphalt blasted into a third pass, Red Mountain Pass, between the towns of Silverton and Ouray. In the summer, Red Mountain Pass is a breathtaking drive through the San Juan Mountains. There are no guardrails, hardly any shoulder. If your tire caught the edge and you went off, the fall is hundreds of feet. Cliffs and canyons soar above and below. In the winter, this is one of the most avalanche-prone highways in the lower 48 states. One hundred-sixty slide paths breach a 20-mile stretch of pavement. I've driven it many times in powder snow on the highway, strong crosswinds building drifts. The day we came through was a blizzard with stretches of complete whiteout where we had to stop mid-highway and wait for visibility to return. If you kept driving blind, you could go off the edge. One spring night years ago, more than 60 avalanches crossed a 5-mile stretch of this highway. The town of Ouray was buried in a sudden 4 feet of snowfall. I was working at the weekly paper in Ouray at the time, and we had just put the flats to bed, ready to ship to the printer in the morning. Having a drink at a bar on main street, the highway through town, we were toasting another edition when we saw the flashing lights of a snowplow heading toward the pass. We paused our toast and watched the lights through blinding snow, each of us thinking this cant be a good. That night, the driver of that snowplow, Eddie Imel, was killed by the infamous East Riverside Slide. He was the third snowplow driver to perish on that same 100 feet of highway. The pass had been closed, but cars that had come over from the Silverton side were trapped in a concrete snowshed that covers a piece of highway, protecting it from slides. An avalanche had hit the shed and blocked one side. Eddie and his partner Danny Jaramillo had gone up to clear the slide and get people down. A chain broke on the snowplow tire in front of the snowshed and while they were out fixing it, East Riverside ran, and buried them. triggers, where an avalanche that starts above you rather than under you. Conditions worsen when the snowpack has a weak layer caused by ice or faceted crystals. If this weak layer is buried deeply, everything on top of it is in danger of running. This was the case for the avalanche that killed Eddie. The snow sitting out before the storm had frozen on the surface into a crust, so it didnt bond with the powdery feet to come. Triggers were natural, the load too much, slabs coming off everywhere in the San Juan Mountains that night, basins high above tree line filling and running over and over. Driving the pass the other day was about 40 miles of 5 or 10 miles per hour, rarely another vehicle to be seen. Those we did see emerged like ghosts and drifted past us. Every chute and coular you drive beneath comes with a tingle, a sense of gravity from above, as if a piano were hanging over your head by a fraying rope. We havent had a great winter for snow, usually it would be much deeper on the pass, but in a storm like this it builds and runs, builds and runs. You cant see whats happening above you. A couple weeks earlier an experienced local skier was killed in an avalanche near here after 20 inches of snow fell in a 24-hour period. It was the states first avalanche death of 2018. There will be more. There always are. The slide that killed Eddie didnt kill his partner. For 18 hours Danny was under the snow, and wed given both of them up for dead. He used a flashlight as a shovel to get back to the buried plow, where he broke in, retrieved an actual shovel, and dug straight up till he hit open air. He made it back to the snowshed and called in on an emergency phone asking if someone could bring him cigarettes. The day after Danny got out, the storm cleared to bluebird skies. I came up with crews trying to reach Eddie's body. About a mile from the buried snowplow, two avalanches exploded at once. Snow boiled out of the mountain above us. People started backing away. Then they ran. But it was no use. We couldn't outrun a pair of avalanches. I stayed put. Where are you going to go? The two avalanches met and roared into the canyon below. They didn't have enough force to climb the opposite side to the highway. If they had, we would have been buried. Instead, they sent up a burst of wind, coating us with snow. When the cloud settled, everyone was safe. Some laughed, while others staggered around breathless. I was on the steering wheel as we drove through the concrete snowshed the other day. Rolling out the downhill side, we were beneath the rocky plunge of East Riverside. I always slow down here in the winter and lean over the dashboard looking straight up. 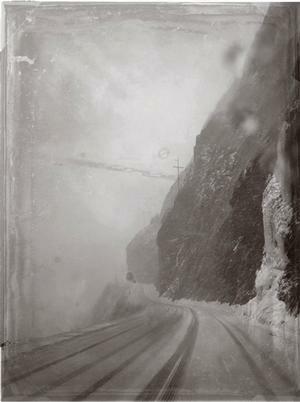 Through the snow-glazed windshield, we saw spindrift winding down through the air, and the weight of snow high above invisible in the storm. I held my breath as the mountains held theirs, waiting to let go.